Editor's note: Mitt Romney is the former governor of Massachusetts and was a candidate for the Republican nomination for president in 2008. This commentary was adapted from remarks he made last week to the House Republican Conference. (CNN) -- These are extraordinary times, and like a lot of Republicans I believe that a well-crafted stimulus plan is needed to put people back to work. But the Obama spending bill would stimulate the government, not the economy. 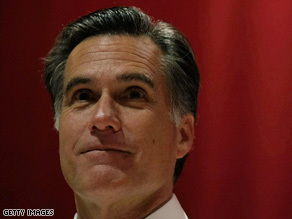 Mitt Romney says Obama's spending bill would stimulate the government rather than the economy. We're on an economic tightrope. The package that passed the House is a huge increase in the amount of government borrowing. And we've borrowed so much already that if we add too much more debt, or spend foolishly, we could invite an even bigger crisis. We could precipitate a worldwide crisis of confidence in America, leading to a run on the dollar or hyperinflation that wipes out family savings and devastates the middle class. It's still early in the administration of President Obama. Like everyone who loves this country, I want him to adopt the correct course and then to succeed. He still has a chance to step in and insist on spending discipline among the members of his own party. It's his job to set priorities. I hope for America's sake that he knows that a chief executive can't vote "present." He has to say yes to some things and no to a lot of others. As someone who spent a career in the private sector, I'd like to see a stimulus package that respects the productivity and genius of the American people. And experience shows us what it should look like. Mitt Romney talks about the stimulus plan on "American Morning." Second, any new spending must be strictly limited to projects that are essential. How do we define essential? Well, a good rule is that the projects we fund in a stimulus should be legitimate government priorities that would have been carried out in the future anyway, and are simply being moved up to create those jobs now. Third, sending out rebate checks to citizens and businesses is not a tax cut. The media bought this line so far, but they've got it wrong. Checks in the mail are refunds, not tax cuts. We tried rebate checks in 2008 and they did virtually nothing to jump-start the economy. Disposable income went up, but consumption hardly moved. Businesses aren't stupid. They're not going to invest in equipment and new hires for a one-time, short-term blip. What's needed are permanent rate cuts on individuals and businesses. Fourth, if we're going to tax less and spend more to get the economy moving, then we have to make another commitment as well. As soon as this economy recovers, we have to regain control over the federal budget, and above all, over entitlement spending for programs such as Social Security and Medicare. This is more important than most people are willing to admit. There is a real danger that with trillions of additional borrowing -- from the budget deficit and from the stimulus -- world investors will begin to fear that our dollars won't be worth much in the future. It is essential that we demonstrate our commitment to maintaining the value of the dollar. That means showing the world that we will put a stop to runaway spending and borrowing. Fifth, we must begin to recover from the enormous losses in the capital investment pool. And the surest, most obvious way to get that done is to send a clear signal that there will be no tax increases on investment and capital gains. The 2001 and 2003 tax cuts should be extended permanently, or at least temporarily. And finally, let's exercise restraint in the size of the stimulus package. Last year, with the economy already faltering, I proposed a stimulus of $233 billion. The Washington Post said: "Romney's plan is way too big." So what critique will the media have for the size of the Obama package? In the final analysis, we know that only the private sector -- entrepreneurs and businesses large and small -- can create the millions of jobs our country needs. The invisible hand of the market always moves faster and better than the heavy hand of government. The opinions expressed in this commentary are solely those of Mitt Romney.